Illustrator with an Eye for Design & Dazzling Doodles. Works in Ink & Watercolor with Empowering Emotions. 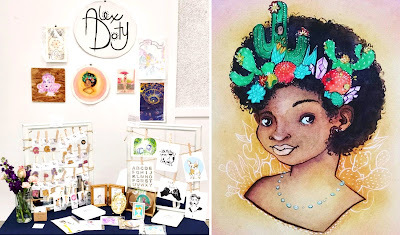 When I look at the work of local illustrator Alex Doty, I see playful, colorful works full of poise. I appreciate how Alex makes her cartoon-like drawings sophisticated and skillful! The way she mixes pen and ink with watercolor yield truly beautiful little illustrations. She is very adept at portraits of people and pets. She does a lovely job of defining forms and celebrating what's unique about everyone and everything she depicts. Kudos to her for helping women be proud of their bodies, curves and all. The way she draws the human form is both well practiced and full of love for shapes. Alex has also done a bit of design in her day with fun hand lettering. More recently, Alex has been exploring the art of glass blowing, and it's really neat to see the way she translates her style to a new medium. 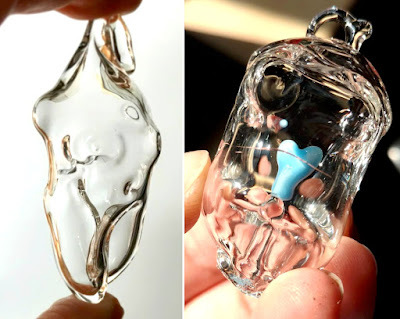 Much like she draws the feminine form, her miniature blown glass bodies are excellent celebrations of shape. She works with clear glass for the most part, but will sometimes put a heart inside or hints of color. Whether or not you are a feminist yourself, it's hard not to see the loving and empowering vibes that Alex is sharing through her work. I look forward to seeing the new media Alex will undoubtedly explore as she evolves her own personal style. Alex is also available for commissions if you'd like a family or fur baby portrait with her playful sophistication.